Eva is the winner of the super cute spring bag and pattern! Yo ho ho! I've already sent you an email about the prize, so make sure you check your inbox, Eva :) Now I have to start calling the hippos Esmerelda and Ol' Scurvyshorts, instead of Girl and Boy. Kind of funny, though, that Ol' Scurvyshorts in fact has none (maybe because they were so scurvy?). Esmerelda likes to tease him by calling him Henry, which only his mother ever called him, and only when he was really naughty. As for which pattern I will be writing up, the tally put the girl hippo a few votes ahead. 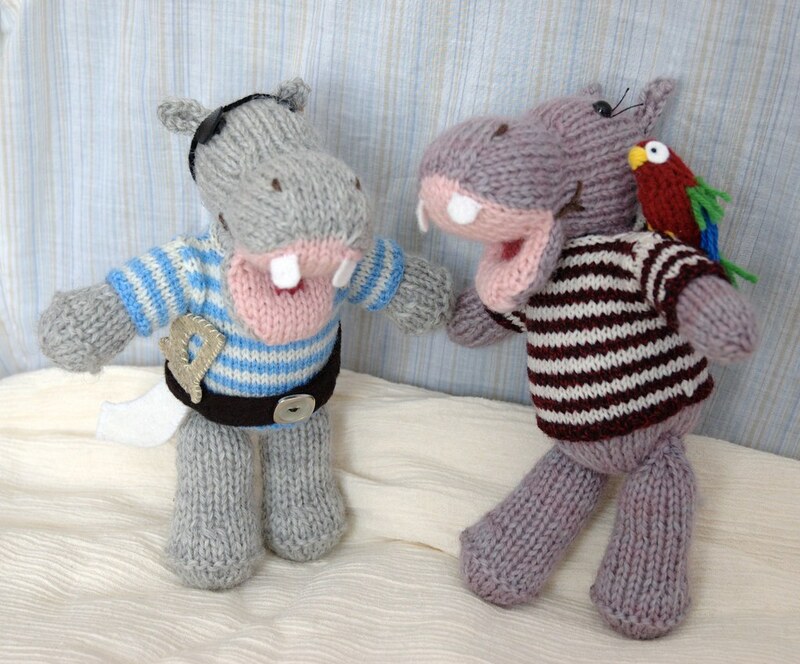 So the Pirate Hippo pattern will have the smaller mouth, and slimmer arms and legs. The pattern will of course include instructions for the parrot, eye-patch, and belt. I will also try drawing out a pattern for the sword, if I can get the scale right. Then you can just print it, cut it out, and trace it to make swords for your own pirates! I should be able to get the pattern ready by tomorrow afternoon, as I'm sure many of you are eagerly waiting for it to be done. The contest winners will get their patterns first, then I'll list it in both my shops. So cute. I really loved the story - it made me want to knit them right now. If he has any other stories rattling around in his brain I would love to hear them. March 17, 2008 at 10:57 a.m.
March 17, 2008 at 11:02 a.m.
March 17, 2008 at 4:18 p.m.
thank you! i'm thrilled i won :) it made my day! March 17, 2008 at 9:46 p.m.
Hi! Just found your blog! Love the hippo, think I'll be needing him!! visit my blog to see the elephant! March 18, 2008 at 9:46 a.m.